Would all you Taureans like to gain invaluable perspective into your lives? You can do so by identifying with mythical heroes associated with your zodiac sign. CG Jung believed archetypal motifs (themes) format our experience of the world. Myth allows access to these motifs in a meaningful way. The following is a myth related to the astrological sign of Taurus. The God Poseidon helps King Minos to gain his crown by giving Minos a magnificent white bull. But when Poseidon asks Minos to sacrifice the bull as repayment, the King can’t bring himself to part with it. Poseidon is not amused. As punishment, he causes the Kings’ wife to fall passionately in love with the bull. With contrivance, the King’s wife mates with the bull and gives birth to the Minotaur who is half man (intellect) and half bull (instinct). Conceived as the result of the King’s greed, the Minotaur (which feeds on young men and women) is a shameful secret to be hidden in the dark labyrinth beneath the palace. 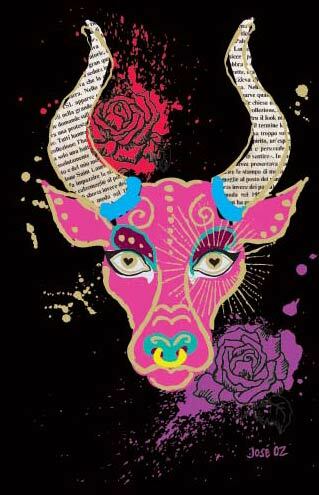 Taurus has a reputation for being possessive, materialistic, indulgent, and extremely concrete. Carried to an extreme, Taurus can be almost pathological in her fear of change and loss. It is interesting to note that with Border-line Personality Disorder, it is precisely the failure to attain self and object constancy that produces the classic clinging behaviour. Likewise, if the sensibilities of Taurus are not well integrated, natives of Taurus can expect such extremes of obstinacy and possessiveness , which compensate for a lack of inner security. 1. What images do you have of bulls and how might they relate to this story? 2. What is the relationship between instinct (passion/desire) and intellect (judgement) in this story? 3. Did Poseidon have a right to be so angry and why did he choose the punishment that he did? 4. Why did the Minotaur turn out so nasty? Did it have to be this way? 5. What monsters have you created when you let your passion override? Previous article Resurrection leads to Judgement and from there to …. ?